5" A/O Sanding Disc, U612 150-A Grit PSA 5 Hole, 100 pk. 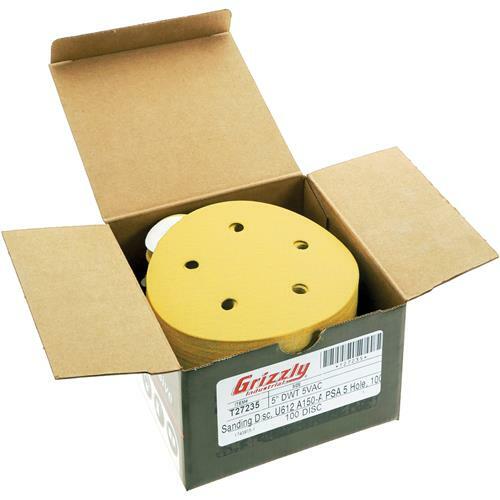 Grizzly T27235 - 5" A/O Sanding Disc, U612 150-A Grit PSA 5 Hole, 100 pk. These gold level aluminum oxide discs from PASCO have a faster rate of cut and longer life versus competitive "A" weight disc products - and for a better price to boot! The backings are resin bonded discs coated with zinc stearate to resist loading and are laminated to resist edge tears. Backs are Pressure Sensitive Adhesive (PSA) and include a 5 hole dust collection pattern. 150 grit, 100 discs per roll. Good sanding disc. Have bought before, will buy again.